The proofing process is very important to us, as one small error or omission can ruin an entire project. We go to great lengths to proof every job for accuracy. Every client has a hand in the proofing process. 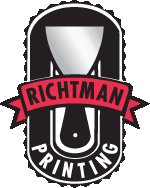 At Richtman Printing, our clients should be the ultimate judge of their own project. In order to streamline this process, we provide an innovative online proofing system that allows you to view proofs without leaving your computer.